One day I was pursuing through Pinterest and came across a dish that looked amazing. It was in a cast iron skillet with a red sauce and baked eggs. I didn't even click on the recipe to read about it, but the image stuck in my mind. 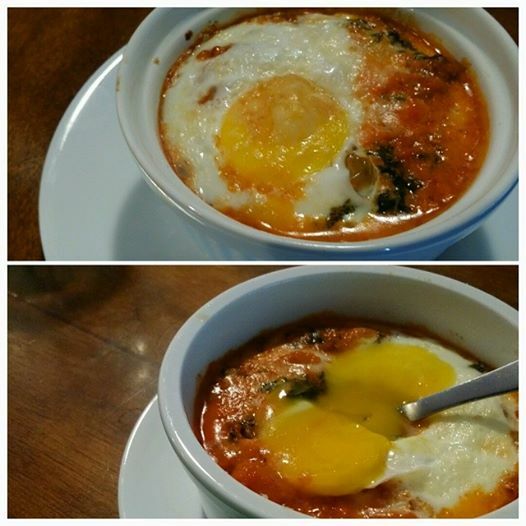 (It was called shakshuka for those interested.) That being said, the image stuck with me for a couple of days. Last night as I lay in bed trying to fall asleep, I thought about it and starting thinking, perhaps I could make something using it as an inspiration point with the ingredients already in my house. So this is what I made, I think it was really good. Feel free to change/omit or completely do your own thing! I'm sure I broke a few culinary laws in making this. In a large skillet brown your sausage. When it is mostly cooked add diced bell pepper and kale. Cook until vegetables are tender.